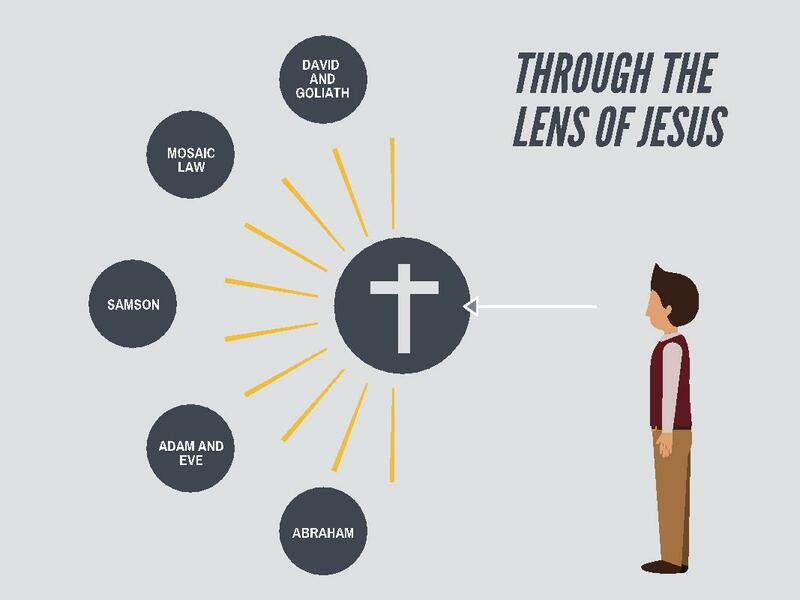 Now there were in the church at Antioch prophets and teachers, Barnabas, Simeon who was called Niger, Lucius of Cyrene, Manaen a lifelong friend of Herod the tetrarch, and Saul. While they were worshiping the Lord and fasting, the Holy Spirit said, “Set apart for me Barnabas and Saul for the work to which I have called them.” Then after fasting and praying they laid their hands on them and sent them off. So, being sent out by the Holy Spirit, they went down to Seleucia, and from there they sailed to Cyprus. 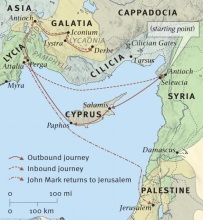 When they arrived at Salamis, they proclaimed the word of God in the synagogues of the Jews. And they had John to assist them. When they had gone through the whole island as far as Paphos, they came upon a certain magician, a Jewish false prophet named Bar-Jesus. He was with the proconsul, Sergius Paulus, a man of intelligence, who summoned Barnabas and Saul and sought to hear the word of God. But Elymas the magician (for that is the meaning of his name) opposed them, seeking to turn the proconsul away from the faith. But Saul, who was also called Paul, filled with the Holy Spirit, looked intently at him and said, “You son of the devil, you enemy of all righteousness, full of all deceit and villainy, will you not stop making crooked the straight paths of the Lord? And now, behold, the hand of the Lord is upon you, and you will be blind and unable to see the sun for a time.” Immediately mist and darkness fell upon him, and he went about seeking people to lead him by the hand. 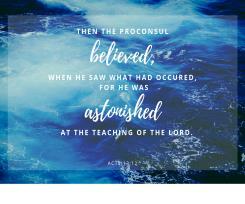 Then the proconsul believed, when he saw what had occurred, for he was astonished at the teaching of the Lord. In the beginning was the Word, and the Word was with God, and the Word was God. He was in the beginning with God…And the Word became flesh and dwelt among us, and we have seen his glory, glory as of the only Son from the Father, full of grace and truth.